2016 and 2017, Secondment at SchoolMaster B.V. I am here on behalf of my employer Luminis. Because the organisation had made a shift do domain specific teams, I was hired to work at a new team specialized in facilitating connections to 3rd parties. 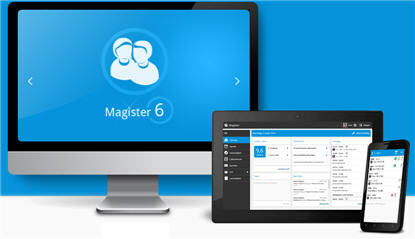 SchoolMaster’s main product is Magister, an educational product suite. 700k users use this software on a daily base. At Magister they heavily rely on self build systems. Almost all of the hardware is in their own datacenter racks. They use a heavily optimized infrastructure to support the different platforms. The main focus is to deliver maximum availability. They are currently in a shift from using monolitic Delphi-application-through-RDP to the modern area of web based cloud development. The team has worked on several projects during my time at SchoolMaster. The main focus of the projects was to integrate external systems by consuming webservices. The scope ranged from negotiating about the interfaces to altering user interfaces to facilitate workflows based on the new data. One of my achievements was that I was able to work in (as in: deeply understand) the old Delpi codebase and do considerable changes to very complex and mission critical systems. Another good thing I remember was that I was able to introduce a very simple model of a complex flow, and extensively used unittests to secure the workings of this flow. During this project my extensive knowledge of MSSQL came to good use. They had performance issues in the old workings of the previous mentioned complex flow and I was able to deeply understand the (brownfield) SQL and implement better alternatives.